Navratri is the most auspicious festival for Hindu community, celebrated all around the world. This year, sharad navratri is starting from October 9, 2018 (Tuesday). Hindu worships Maa Shakti for nine days to get the blessings. 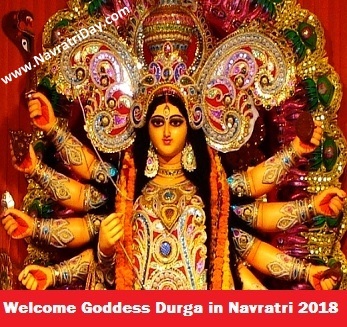 During the Navratri festival, Maa Durga is worshipped in the nine forms, which are Goddess Shailputri, Goddess Brahmacharini, Goddess Chandraghanta, Goddess Kushmanda, Goddess Skandmata, Goddess Katyayani, Goddess Kalratri, Goddess Mahagauri and Goddess Siddhidatri. Navratri festival comes four times in a year with different names. 4- Ashada Navratri is celebrated in monsoon season. The first two Navaratri is celebrated with great fervor while other two are celebrated in some parts of the India. The nine days of Navratri is differently celebrated in different parts of India. The Sharada Navratri basically culminates Maa Durga Puja and Dussehra. The Vasanta Navratri worships avatar of Vishnu mainly Lord Ram so Ram Navami is celebrated on a ninth day. The first three days of Sharad Navratri is invoked for the strength and ferocity of Maa Durga. For next three days, Maa Lakshmi is worshipped, who represents the wealth and prosperity in our life. The wealth here refers to the spiritual wealth. People worship Goddess Lakshmi to invite her to bring wealth. The last three nights are spent in worshipping Maa Saraswati who signifies the highest wisdom and knowledge. Here knowledge represents the knowledge of self. During the Sharad Navratri, devotees worship nine goddess on each day. They keep fast for nine days and do bhajans and kirtan to make Goddess happy. The last day is celebrated with Ayudha puja in this all the works tools household appliance and vehicle is worshipped. According to legends, on the tenth day of navratri Maa Durga had killed the demon Mahishasur. On the tenth day, navratri festival ends by the celebration of Dussehra, which is celebrated as the victory of good over evil. Dussehra is also celebrated, because Lord Rama killed the demon Ravana on the same day of Dasara. Different people, with one reason that is the victory of good over evil, celebrate Navratri. It is the most auspicious festival when various rituals and pujas are done to worship different forms of Maa Durga. It is celebrated to establish a connection with a supreme power of God. The Navratri is also considered as Hindu festival of dance. In some parts of the India, people perform Dandiya and Garba dance during navratri. Especially, in Gujarat and Maharashtra people created Pandals to perform these dance forms. According to western calendar, Sharad navratri is celebrated in the month of September or October every year. This is the time, when winter starts. According to Hindu calendar, it is celebrated in the month of Ashwin. Sharad navratri is also known as Maha Navratri and it is celebrated with huge devotion in most of the parts of India. Ghatsthapana ritual is performed on the first day of navratri. This is the time to put Kalash, Jawahare (Seeds) and Goodess at home. On this day, goddesses are invoked at home and the devotees have made worship. On the last day, navratri visarjan is made by devotees, in which idols of goddess Durga have been left in the river. During 2018 Sharad navratri, why not you keep the fast for nine days and worship different aspects of Maa Durga. Maa Shakti is mother goddess in all over the world, who fulfills the wishes of their devotees. If you want to see some amazing rituals then you should go to few wonder places. In 2018, you can witness the “Durga Puja in Kolkata” or take a visit to “Grand Pandals in Gujarat” or can witness the “Dandiya in Maharashtra”. Happy Sharad Navratri 2018 to All.! !